KNCV Tuberculosis Foundation is an association. The Executive Director carries statutory responsibility and conducts day to day management, supported by The Management Team. The General Assembly is the highest decision-making body. KNCV has a Board of Trustees that acts in a supervisory and advisory capacity. Kitty van Weezenbeek, MD, PhD, MPH, is the Executive Director of KNCV Tuberculosis Foundation. 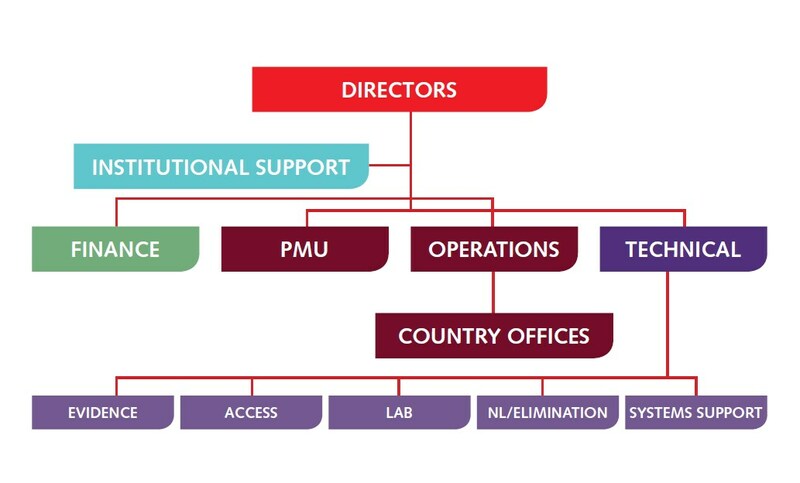 The “Good Governance Framework at KNCV Tuberculosis Foundation”, developed by KNCV Tuberculosis Foundation, is closely aligned with the principles developed by the Wijffels Commission. These were formulated in the Code of Good Governance for Charitable Organizations and adopted in 2005 by the Dutch Fundraising Institutions Association (Goede Doelen Nederland). In drawing up the Good Governance Framework KNCV Tuberculosis Foundation’s aim was to create the necessary conditions for clear lines of command, effective supervision of the management and transparent accountability (in advance and in retrospect). Each year, the Foundation’s directors and trustees render an account of the application and effectiveness of management and supervision to the general assembly and in the annual report. The Good Governance Framework and the Wijffels Code are designed to achieve added value by stimulating the quality of organizational functioning. This quality objective guides the structuring of KNCV Tuberculosis Foundation’s governance. The organizational functioning involves: meeting the objectives, the best possible allocation of resources, efficient operations, and appropriate fundraising. To download KNCV’s Governance and Management Framework (updated June 2014), please click here. KNCV Tuberculosis Foundation is a membership association. To download the latest version of the Articles of Association (23 August 2012), please click here.